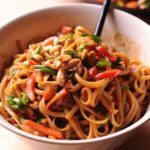 Easy Thai Noodles With Peanut Sauce - What's In The Pan? 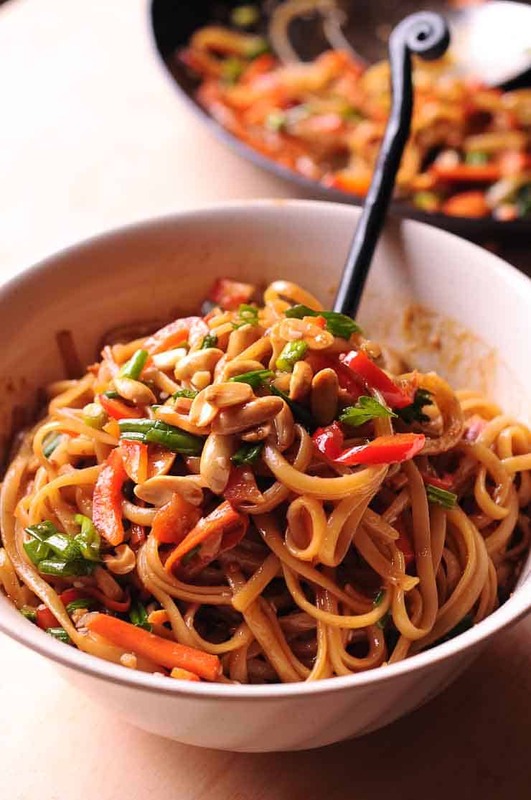 Easy Thai Noodles With Peanut Sauce is a spicy Thai noodle dish. I made it with sweet and spicy peanut sauce. 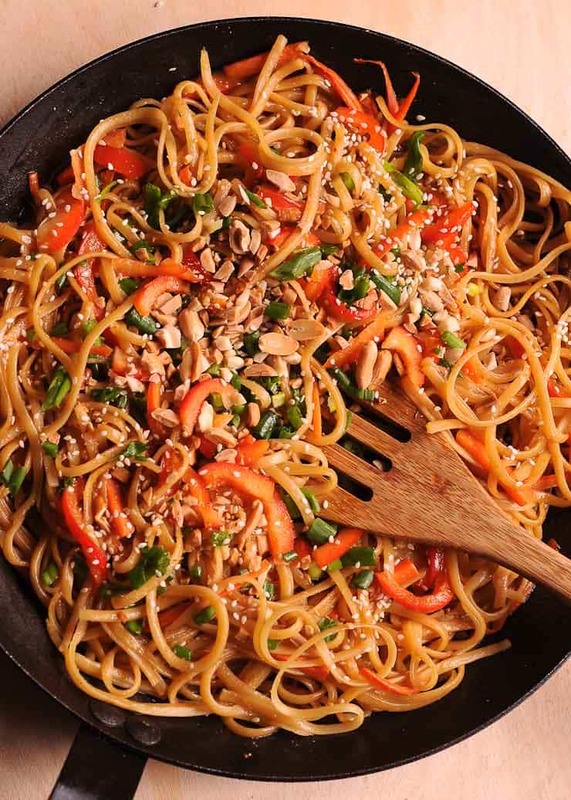 This vegeterian noodle recipe calls for colorful veggies, peanut butter, and soy sauce. 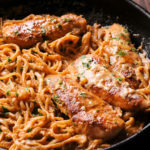 Such an easy every day dish! Better than a restaurant take-out! 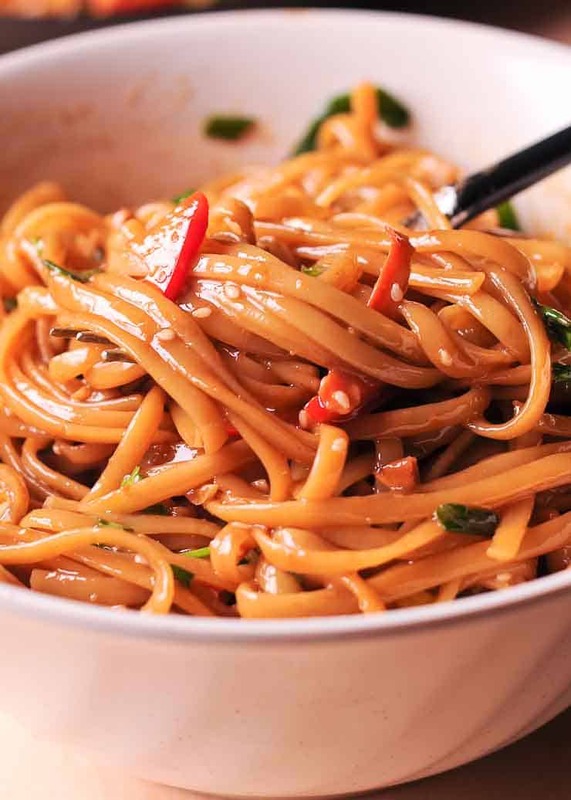 To begin with, these delicious Thai Noodles recipe is a great weeknight dinner! I used regular ingredients and made it super easy! You will love the simple, but authentic spicy Thai sauce. It’s spicy, yet sweet. Those two go hand in hand together. Besides, you won’t have to hunt for too many unfamiliar ingredients. Soy sauce, peanut butter and chili sauce. How about using regular linguine here? If you are not sure about rice noodles, use long ribbon pasta that you are familiar with! I did. Of course, you can also make it with ramen noodles, rice noodles, or even gluten free pasta. But I love how versatile this easy noodle recipe is! 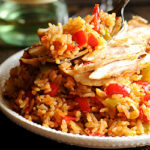 Last but not least, this easy dinner recipe brings perfect amount of spice. But not overwhelming at all. By the way, do you see that I didn’t use a wok? Look at the pictures above. I used a carbon steel pan instead. I love the fact that you can use a regular pan to make this amazing Thai noodle recipe. 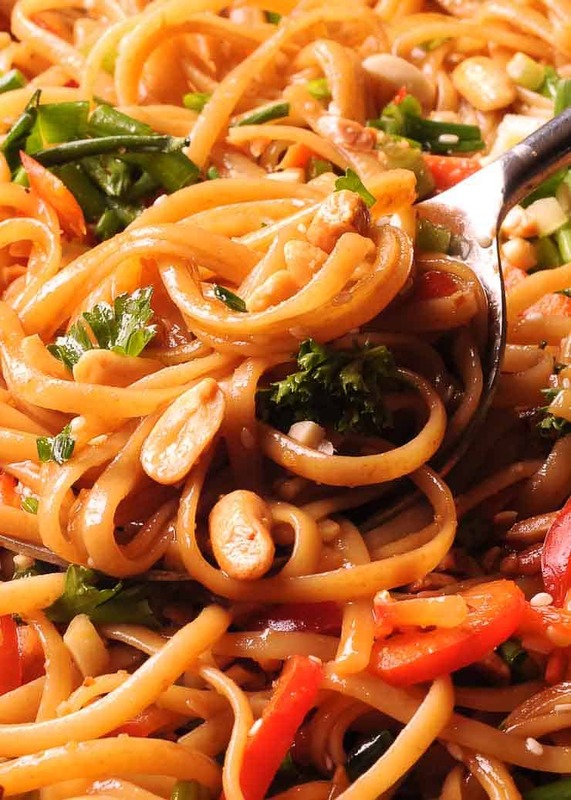 This easy vegetarian noodle recipe tastes like stir fried noodles. Except, there is no need to fry any noodles! The spicy sauce does all the work. Together with soy sauce and peanut butter. 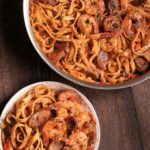 If desired, you can add pork, ground beef, chicken, or shrimp. I most likely will. In my next Thai noodles recipe. Tamari sauce. Tamari is a Japanese sauce that is very close to the taste and flavor of soy sauce. The main difference is that tamari sauce contains very little sodium. This can be a good thing or not. It also contains no wheat, which makes it a gluten-free option. Coconut aminos. Coconut aminos has a bit sweet flavor. It contains far less sodium than soy sauce. You can definitely use it as a healthy soy sauce substitute. Made from coconut trees with some sea salt, coconut aminos is also gluten free. So perfect for weeknight dinner! You might also like Beef Ramen Noodles Stir Fry and Chicken Chow Mein Noodles. Spicy Thai Noodles made easy! Boil pasta or noodles according to box directions. Then drain. While the pasta is cooking, prepare the sauce. In a medium sized bowl, whisk together soy sauce, agave syrup, peanut butter and chili sauce until fully combined. Set aside. Preheat oil in a large skillet. Add bell pepper, carrots and garlic and sauté for 2-3 minutes. 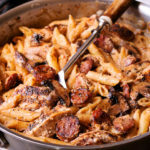 Add drained pasta and sauce into the skillet and mix until fully combined. Top with chopped peanuts, cilantro, green onions and sesame seeds. Very easy to make. I put extra peanuts for protein (I’m vegeterian). I often add cashews to this.